A family in Canada has built the world's largest QR code out of a corn maze. TODAY.com's Dara Brown reports. Farmers know: If they build it, you will come. We’re talking about corn mazes — works of art, amusement parks and fall attractions all rolled into one. Creating a maze is high-tech these days, with the pattern designed on a computer and then carefully transferred onto a corn field with the help of grids, detailed maps and even satellite navigation systems. “(Our maze creator) uses a GPS that is attached to a small tractor. He downloads the maze layout to the device and it tells him every turn to make,” said Misty Duren, who manages the Corn Dawgs maze in Loganville, Ga. Here are five corn mazes to remember. This 15-acre maze contains the world’s largest Quick Response (QR) code — scan it with your smartphone from above and it links you to the farm’s website. 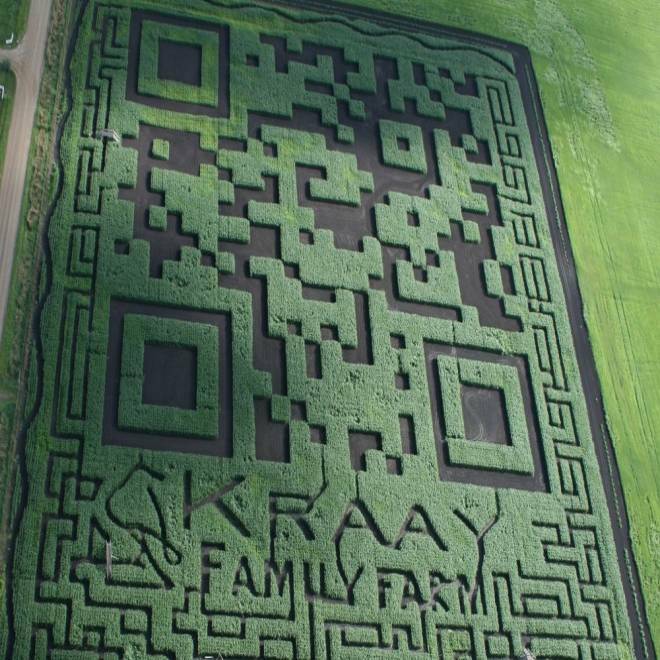 The Kraay Family Farm's 15-acre corn maze in Lacombe, Alberta, contains the world's largest QR code. The Kraay family, which has been creating corn mazes for 13 years, came up with the idea while brainstorming for this year’s design. “We were looking through some magazines and noticed how many QR codes there were,” said Rachel Kraay. There were tense moments when the family went up in a helicopter to scan the maze for the first time and found the QR code didn’t work. The problem? Not enough contrast between the green corn and the dark paths QR codes are usually black and white, providing lots of contrast. So the paths were tilled and cleared of any weeds, making them darker and the next attempt was a success. “We were relieved and excited,” Kraay said. The excitement grew when Guinness World Records officially deemed it the world’s largest QR code this summer. Fritzler Corn Maze — LaSalle, Colo. Owner Glen Fritzler is a huge Denver Broncos fan, so he decided last fall that he would devote this year’s corn maze to Tim Tebow. But when the NFL star was traded this spring, Fritzler set his sights on Peyton Manning, who joined the Broncos in March. 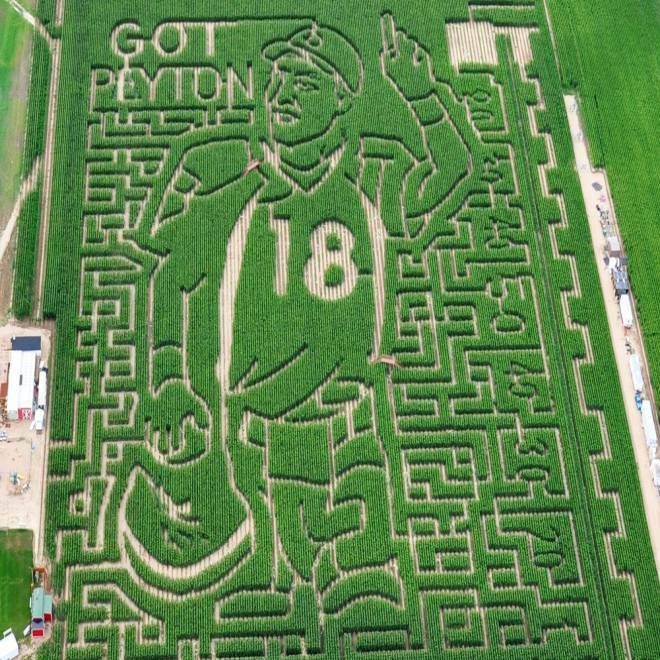 Glen Fritzler of Friztler Corn Maze in LaSalle, Colo., made this year's maze a tribute to Peyton Manning, who joined the Denver Broncos in March. The 15-acre tribute to Manning features the quarterback saluting towards the sky and the phrase “Got Peyton” over his shoulder. Baggenstos Farm — Sherwood, Ore. The Baggenstos family tries to base their corn maze theme on a current event, so this election year the choice was a “no-brainer,” they said. 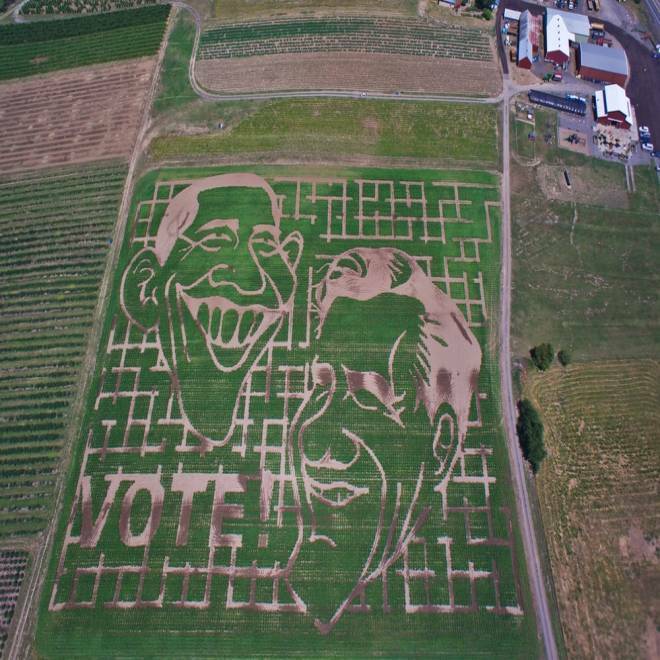 The faces of Barack Obama and Mitt Romney adorn the corn maze at Baggenstos Farm in Sherwood, Ore.
“We want to encourage people to vote, and we wanted something that would stick in their minds as the election approaches this year, so we decided that a humorous take would be the ticket,” said owners Darla and Jacquie Baggenstos. Visitors can cast a vote for their favorite presidential candidate, and the farm will announce those “election results” on its website on Nov. 1. Reding Farm — Chickasha, Okla.
Coming in at 35 acres, owners Jerry and Nancy Reding bill the attraction as the largest maze in Oklahoma. This year’s theme is a love letter to the Oklahoma City Thunder at the request of the couple’s daughter. 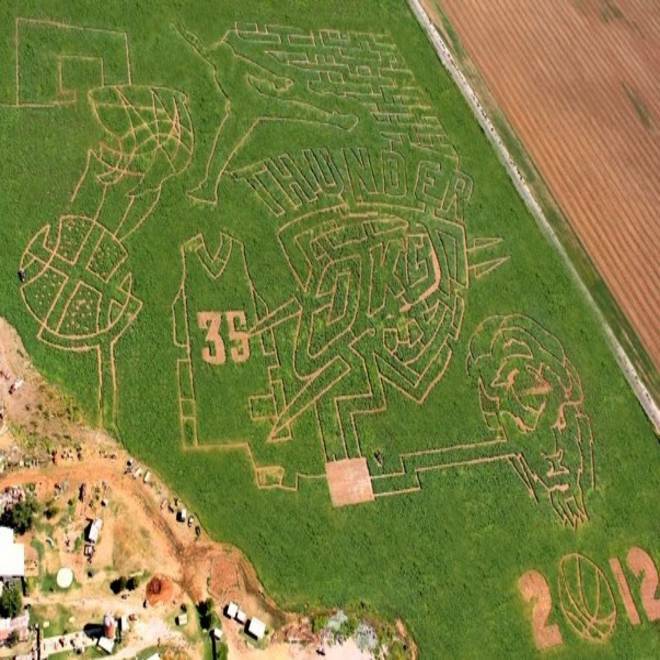 The corn maze at Reding Farm in Chickasha, Okla., is dedicated to the Oklahoma City Thunder basketball team. The family obtained permission from the team to use its logo and went on to carve out a basketball extravaganza, complete with a player shooting hoops and team mascot Rumble the Bison. “We do not know if any of the team will attend but we would welcome them with open arms and they would know how much we love the Thunder,” said Nancy Reding. It should be noted that this maze is actually created out of sorghum, a cereal crop similar to corn that’s drought resistant. Open Sept. 28 - Nov. 4. Corn Dawgs — Loganville, Ga.
Owners Misty Duren and her husband love the Atlanta Braves, so they wanted to honor Chipper Jones — the team’s long-time third baseman who is planning to retire after the 2012 season. 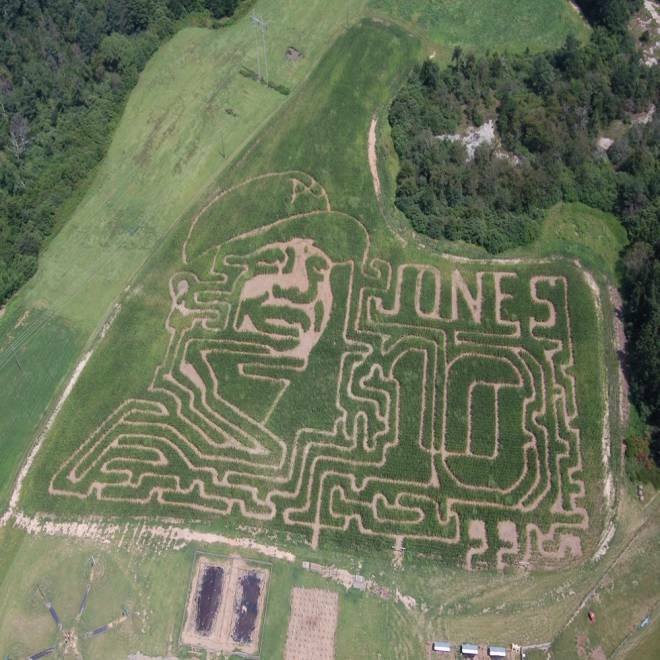 The Corn Dawgs maze in Loganville, Ga., is dedicated to Atlanta Braves third baseman Chipper Jones. The maze features a likeness of Jones as well has his number 10. Fans can enjoy four miles of trails and trivia about the baseball star. “We hope that he comes out to Corn Dawgs and maybe he can get lost in the maze,” Duren said. Open Sept. 23 - Nov. 4.